We see constant change in every industry and the performing arts world is no different. One fact remains that you must be able to keep the events coming and keeping your patrons and performers happy. Facilities are continuing to see changes in a few distinct areas; use of their space to stay profitable and providing their patrons with the best experience possible. These two areas are being addressed with the use of new products that are flexible to meet the demands of the theater. Reconfigurable or flexible seating is a big trend with auxiliary spaces like black box theaters. Traditional theaters can have this auxiliary space which will help pay the bills when the main stage is not being used. These spaces usually use different layouts for different events so having the reconfigurable seating is extremely beneficial to give your audience a great experience by maximizing seating capacity and giving them the best views possible. 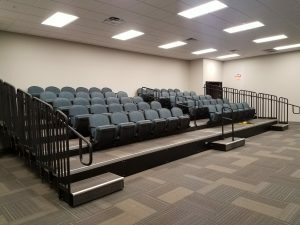 A couple things to consider when looking at using reconfigurable seating are your storage capabilities, setup crew, local and national code requirements. Continuing with the theme of flexible spaces, telescopic seating risers can also be beneficial for a flexible performance space. 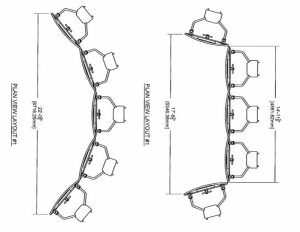 A telescopic seating riser will be able to retract when the space is being used for events that do not require tiered seating. Telescopic risers provide many benefits from reliable and accurate deployment, to fast conversions with limited staff. We work with a facility in Melbourne, Australia that converts their venue 3-4 times per week that requires 6 people a couple of hours to move over 1000 seats from set up to storage. One day they can use the space for a theatre and then they can turn around and host a trade show the very next day. Being able to be flexible and host multiple different events like this is how they’re able to stay profitable. Having the telescopic risers helps them convert their space in time to be ready for the next event and allows them to have more event days in the facility. Sometimes they have just a few hours between events and this increased conversion speed is a necessity. 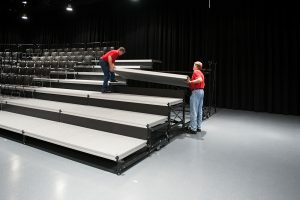 One thing that needs to be consistent with both telescopic and reconfigurable seating risers is the fact that you need to make sure the risers are sturdy and secure to make sure patrons are safe. The best way to do this is to do your research and order from a reputable manufacturer. 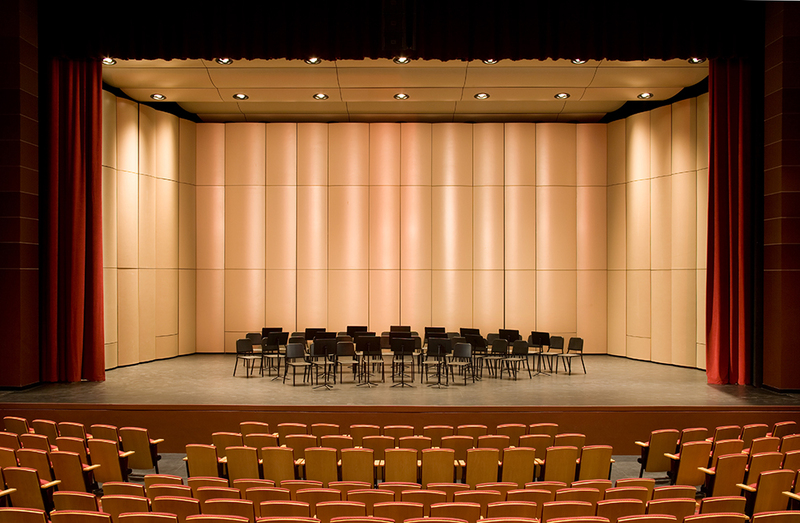 Smaller venues or auxiliary spaces can utilize portable, reconfigurable acoustical shell towers to accommodate different types of performances. Just like with the reconfigurable seating, reconfigurable towers allow a venue to meet the needs of different events. They also allow movement throughout the venue so that you get more use out of your shell purchase. Any space can be converted into a performance space, therefore, maximizing the number and types of events you can support. The image above shows two different possible layouts using the same equipment. Thus, changing from a larger event to a more intimate event. 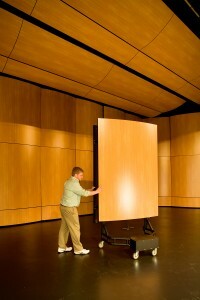 Good portable towers can easily roll and lock into place to create the perfect shell for whatever event you’re hosting. They should even be able to fold down to fit through doorways or put into storage when not in use. As we move into 2019, there are ways to improve performances to keep up with the demands of both performers and patrons. Paying attention to different trends and ideas that are out there can help you stay one step ahead in the ever-changing performance world. Consider adding any of the three product ideas above to improve the flexibility of your facility for years to come.